It seems that the idea of keeping a few chickens in the garden is becoming more and more popular - we all have a bit of the self sufficiency urge buried deep inside us somewhere. Not only do you get a supply of tasty free range eggs, but they provide endless entertainment and recycle a lot of kitchen waste as well. 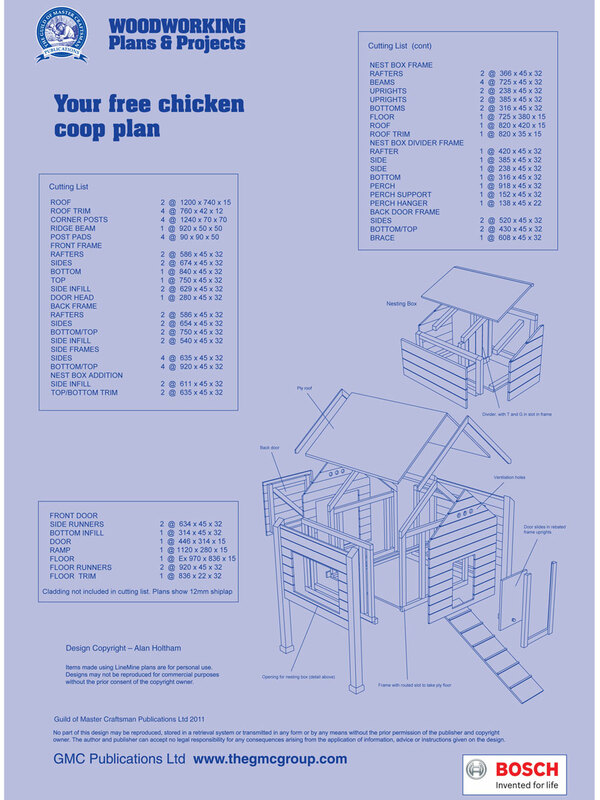 This very sturdy coop is a fairly conventional design that will take 6-8 birds, but I liked the idea of lifting it off the ground for several reasons. Firstly, it gives them somewhere to shelter. Secondly, it prevents vermin such as rats and mice burying underneath and nesting, and thirdly, it maximises the space available for them to run about in. 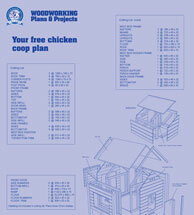 Anything goes as regards coop design, the only fundamentals after security are to provide plenty of ventilation, and a suitable perch for the birds to roost on. 1. The materials for this project are all available off the shelf at a DIY store or builder's merchant, so there are no complications there, and you don't have to spend a fortune on top quality wood either. I settled on fifths redwood which is a lot cleaner than the cheaper whitewood but not as expensive as 'best red'. 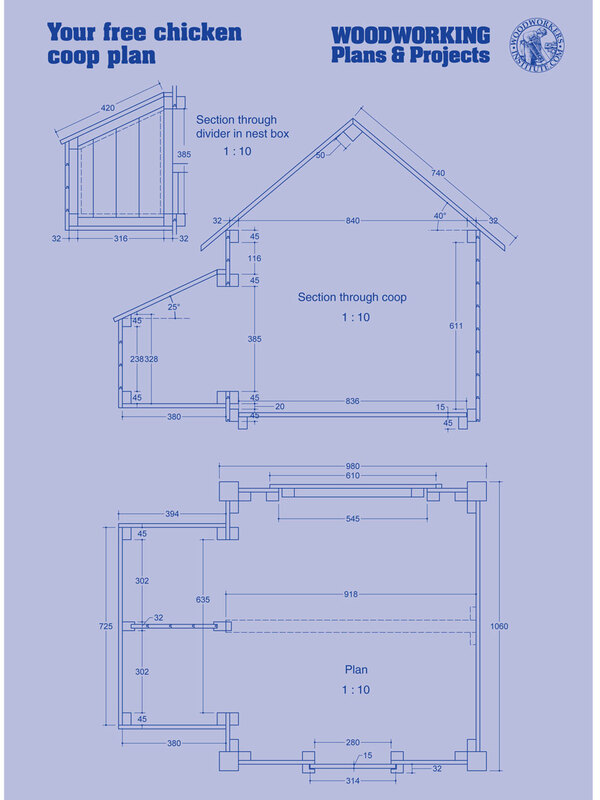 Most of the framing is made from 50 x 38mm and you will also need some 75 x 75mm for the legs, some tongue & groove for the cladding, some exterior 15mm ply and some treated featheredge boards for the roof. 2. Start by cutting the legs to length, but take a close look at them first and make sure you cut away any splits or cracks on the ends as these will trap water and accelerate the rotting process. 3. 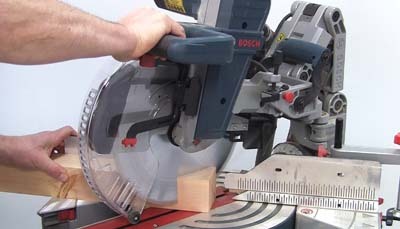 The top slope on each leg needs to be cut at 40° and it is this situation that you cannot beat a decent mitre saw for getting the cuts clean and accurate. If you can rig up some sort of length stop you can cut each component to the exact same length. Accurate cutting is the key to getting everything to assemble properly and care spent at this stage is well rewarded later. 4. My Bosch mitre saw has integral length stops for shorter pieces so I set these up for sizing the framing material and cut the whole batch at once to ensure consistency of matching components. It is surprising just how much material you need even for a relatively small project. 5. 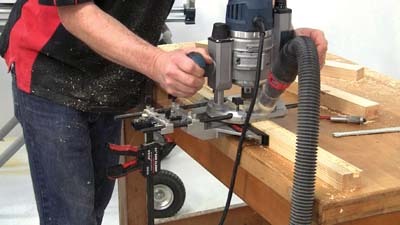 The frames are screwed together and you can speed this job up considerably by using a combined drill and countersink bit; I used an adjustable one made by Colt. 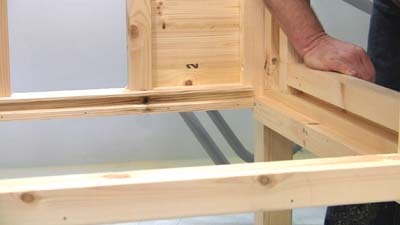 Two screws in each corner will produce a solid joint and stop the frame components twisting. Hold it firmly on a flat surface to get the joint flush. 6. 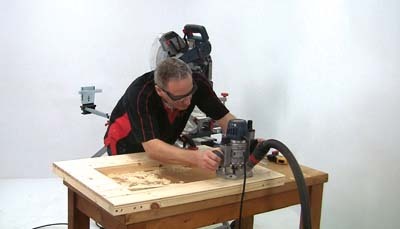 Next, you need to set the torque on your drill driver to make sure the screws are seated properly, but don't pull in so far that they damage the wood. 7. 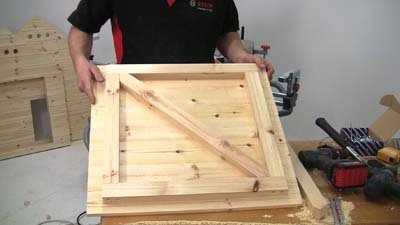 The two side frames have a different layout, the one for the nest boxes having another internal frame. Do remember to assemble this in the right sequence so you don't block access for your driver, i.e. start from the inside and work outwards. 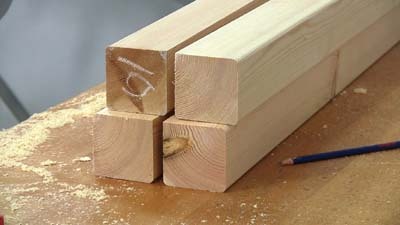 The cladding is standard tongue and groove material with a chamfer on the joint. This makes a much more solid job than shiplap but it is a little more expensive. 8. Cut matching lengths of the tongue & groove in batches to save time marking and cutting each one individually, don't worry about getting them spot on for length at this stage, leave them 2 or 3mm oversize at each end. 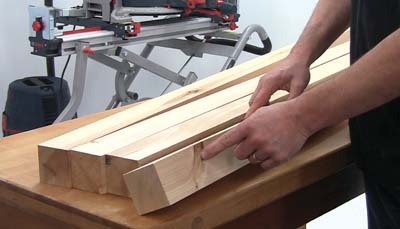 Nail them onto the frames leaving a small amount of overhang at each end, but make sure you get the first one dead level as all the others follow off this one. 9. 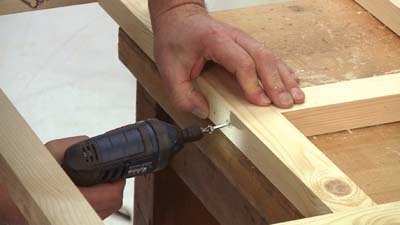 To allow the cladding to move with changing temperatures just fix each board with a single nail through the bottom as this will also hold the top of the board below but still allow it to move. 10. 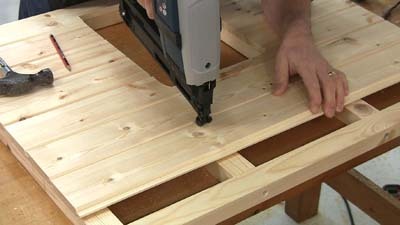 The top board will need cutting to fit the remaining gap, so mark and cut this roughly to size with a jigsaw, again allowing some overhang. 11. 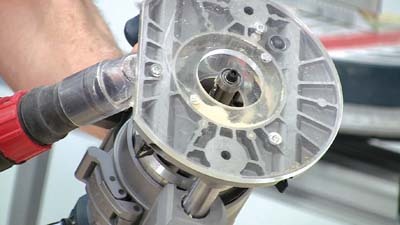 The trick now is to neaten it all up using a straight bearing guided cutter in the router, you will need one with a bottom bearing. 12. Now you need to run this anti-clockwise round the outside of each frame to trim back the overlap, you should be able to do this in a single pass provided you haven't left too much overlap. The result is a perfectly flush finish that is much quicker and easier to achieve than trying to cut and fit each board individually. 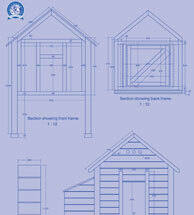 One side is very straightforward, but the other needs a cut out for the nest boxes. 13. 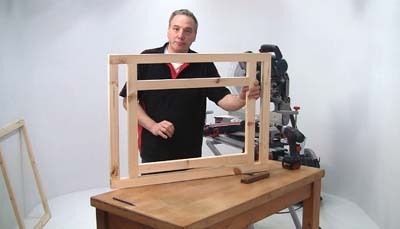 Rout this out in the same way, but remember to work clockwise on internal openings. 14. 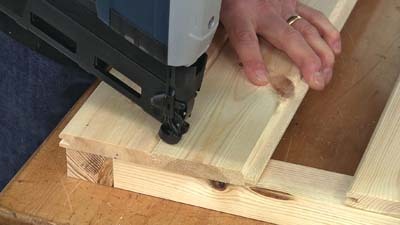 If you leave enough waste material in the corners when cutting the boards, the finished routed result is a very neat radiused corner. 15. 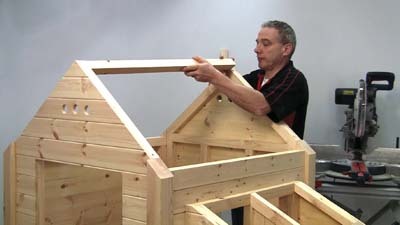 The end frames are made in much the same way, but there is an opening in each and you need to add the angled top to support the roof. 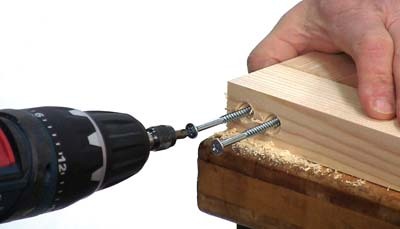 Just think carefully about screw placement here so they don't coincide at the corners where the three components meet. 16. I ignored my own advice about planning the assembly properly and ended up having to use a tiny drill/driver for some of the internal joints. I almost had to resort to using a hand screwdriver at one stage. 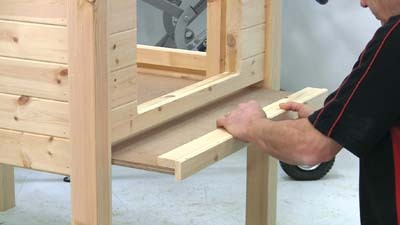 These end frames are clad in the same way as the side frames, but the large openings allow you to use up some of the short offcuts of tongue & groove. 17. 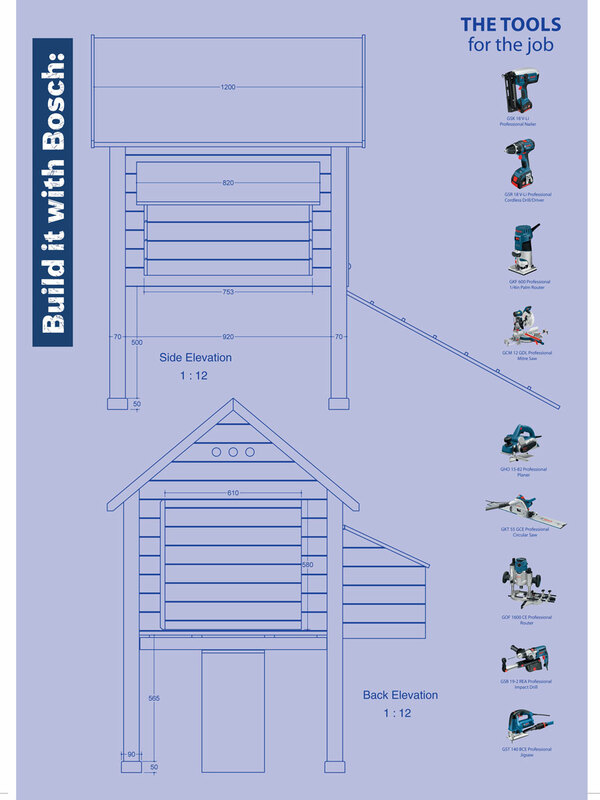 The smaller opening on the front of the chicken coop will form the pop-hole for the chickens to access the coop, but, you don't have to be too fussy fixing the cladding here. 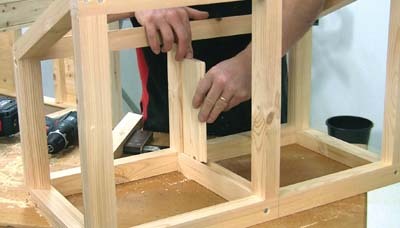 However, you do need to make sure the smaller pieces stay parallel and in line on either side of the opening. 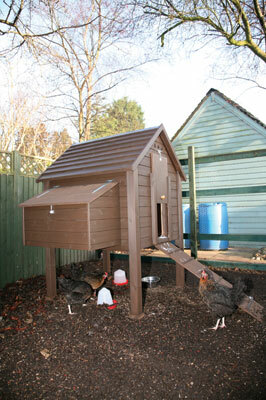 Plenty of ventilation is essential in the coop, so drill some large holes in the cladding boards near the apex. I drilled three at 38mm using a sawtoothed bit. 18. 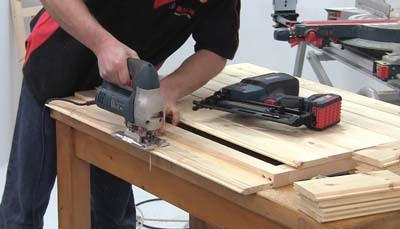 Repeat this for the apex board at either end to ensure a good through flow of fresh air. 20. 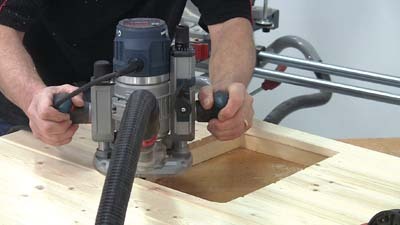 ...and also repeat this round the ventilation holes to leave a much neater finish. 21. The back opening door is another framework clad in tongue & groove, but there is plenty of overhang to ensure there are no draughts when it is shut. 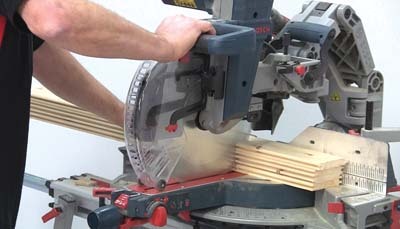 You can't trim back with the router on this one so cut the boards as a batch to make sure they are identical. 22. 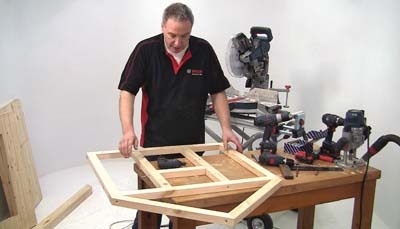 The final job before assembly is to rout a radius on the three exposed corners of the uprights, again to minimise chipping and also to produce a neater finish. 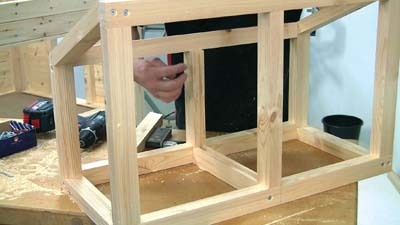 I found it easier to assemble it all on the floor, screwing through the side frames from the inside into the uprights. The nest box side is a bit more difficult as the internal framing gets in the way, so you will have to angle the screws accordingly, just watch it doesn't move when the screws pull up if the angles are too extreme. 23. Fixing the other end looks a bit more precarious if working on your own, but it is actually easy enough to line everything up with the edge of the leg on the inside. 24. 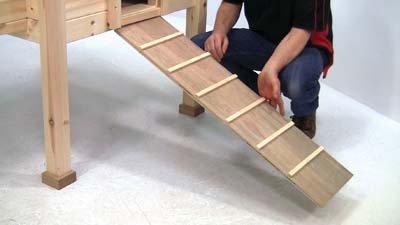 Fit in the two runners for the base which slides in from the rear. 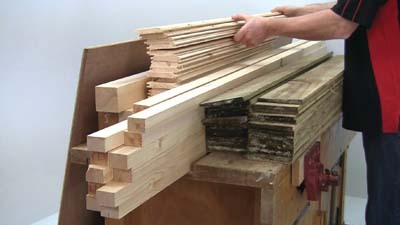 These are just a couple of lengths of the framing material held in place with four screws. 25. 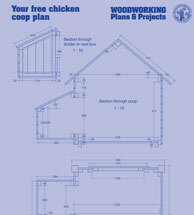 To locate and secure the floor of the coop at the front rout an 18mm groove in another piece of framing. 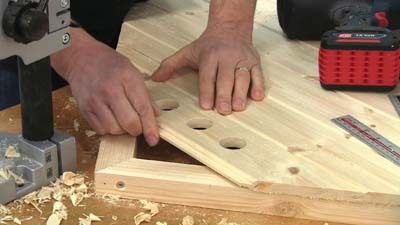 Although the ply base is only 15mm thick it is better to make any sliding components very loose as they will soon get messed up and swell with the damp, so allow plenty of wriggle room or you will struggle to move it later in the process. 26. This locating strip now screws across the front of the coop to line up with the two side rails. 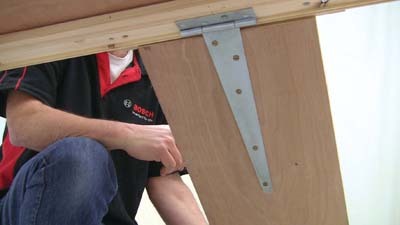 For the sliding base you will need a piece of the 15mm exterior plywood, again cut so that it is not too tight for fit. Radius the top and bottom edges of this all round as well to help it slide more easily on the runners. 27. 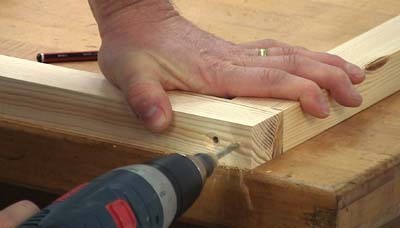 Screw a strip of 50 x 25mm onto the top of the base board and nail a piece of cladding onto the front; this will act as a handle. 28. The nest box is made up separately using more framing material screwed together as before, but I reduced the angle of the lid to 25° to give a bit more headroom. 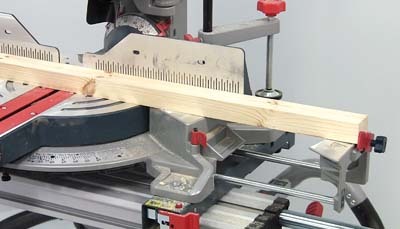 The only slight complication is that the front rail needs to be angled but this is no problem with a portable planer. 29. 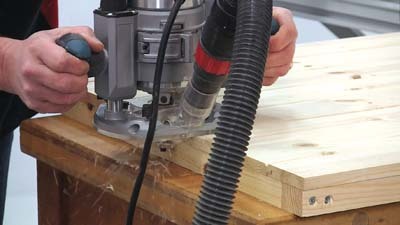 Use the router to produce another piece of grooved material to take the internal divider. 30. Now to make the divider, which is made up from more short ends of tongue & groove, although you could use a piece of the ply instead. 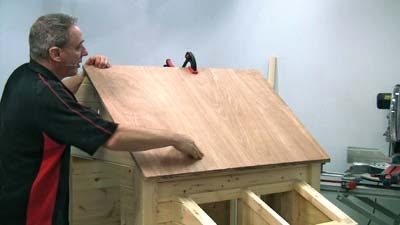 Yet more ply is screwed onto the underneath as the base, but make sure this wood is rated for external use. 31. 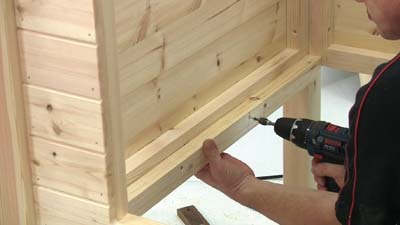 Now you can screw the nestbox frame in place; use some Quickgrip clamps to hold it in place while you line it all up. 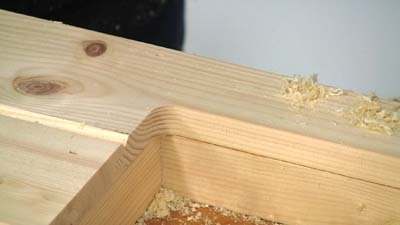 The pieces for the internal divider are cut to length at the 25° angle and then capped off with another piece of the grooved material. 32. 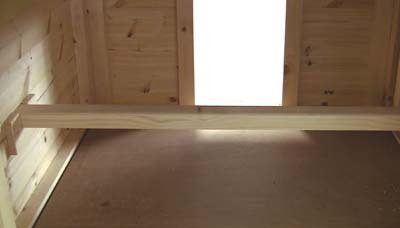 The top roof rail is a length of 50 x 50mm but as the included angle of the roof is now 100° and the 50 x 50mm meets at 90° you will need to plane a slight chamfer on each side with the hand planer. The exact angle is not critical here. 33. 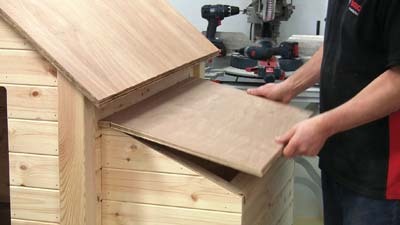 Cut a couple of pieces of the exterior ply to from the roof, but allow plenty of overhang to shed the water well clear of the coop walls and particularly the nest box lid hinges. position. 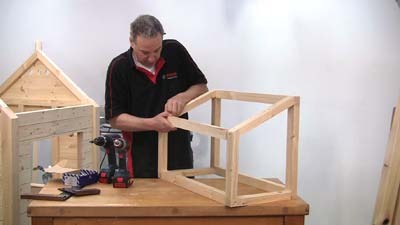 Make sure this does secure properly as you don't want it to dro down accidentally and potentially shut the birds out. 35. 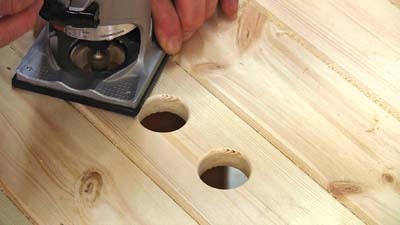 The ladder up to the pop-hole is again ply with some softwood treads pinned across at regular intervals. 36. I fixed this onto the underside with a large Tee hinge so the ladder can be angled accordingly if the coop is moved around. 37. 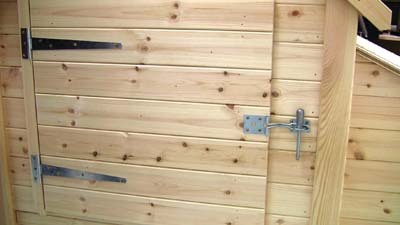 The back door is fitted with a couple more Tee hinges. A hasp and staple keeps it secure. 38. 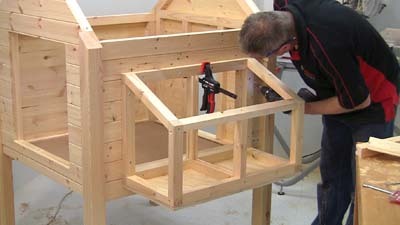 The perch spans the width of the coop and is another piece of framing, but this time flat and with the top two edges well rounded to give the birds a comfortable grip. To protect the softwood legs when they are stood on wet ground I machined up some small square pads from a scrap of 50mm oak, but you could equally stand it up on bricks. 39. 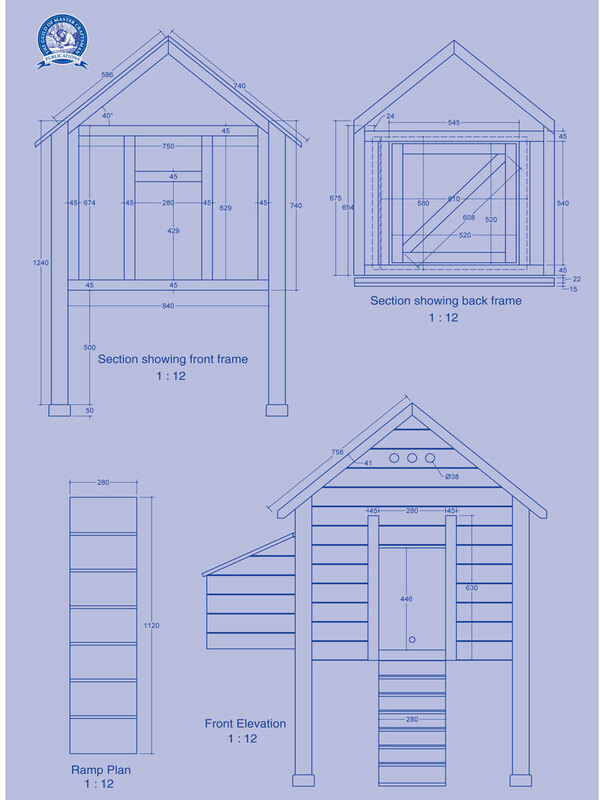 The finishing touches for the project are to fit the hinges for the nest boxes and nail on the barge boards for the roof of the coop. These will hide the cut ends of the treated featheredge board I shall fit when the coop is finally on site. 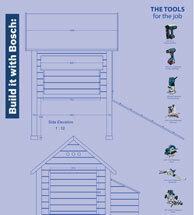 And also, why not like the Bosch Facebook page?